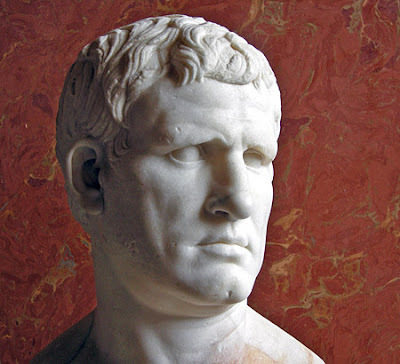 Marcus Vispanius Agrippa, the M. Agrippa inscribed on the facade of the Pantheon. To be a Roman of any standing was to spend your life making good impressions on your peers and your betters. Wealthy Romans were obsessed with appearances and being perceived as a hospitable and welcoming host. These dual obsessions reached their zenith in the dining rooms (triclinia) of the Empire. Before the dinner proper came sea hedgehogs; fresh oysters, as many as the guests wished; large mussels; sphondyli; field fares with asparagus; fattened fowls; oyster and mussel pasties; black and white sea acorns; sphondyli again; glycimarides; sea nettles; becaficoes; roe ribs; boar’s ribs; fowls dressed with flour; becaficoes; purple shellfish of two sorts. The dinner itself consisted of sows’ udder; boar’s head; fish-pasties; boar-pasties; ducks; boiled teals; hares; roasted fowls; starch pastry; Pontic pastry. That my friends is what you serve when you have Julius Caesar and the Vestal Virgins over for dinner. Wow. Roman hospitality was serious business and a big part of impressing your guests was keeping them entertained. Musicians played and sang, actors performed skits, jesters joked and the art displayed in the triclinium was intended to get a laugh while it impressed the viewer with its rarity and expense. Romans reclined on sofas when they ate and threw bones, shells and seeds to the floor. A slave would sweep up periodically, but a good feast left a messy floor. The messy, post banquet floor was the sign of a good host. 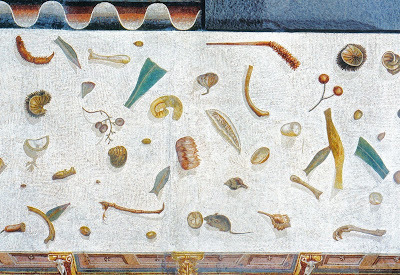 So much so that The Unswept Floor was a recurring theme in the mosaic floors a lot of wealthy Romans used in their triclinia. This is a detail of second century triclinium floor from the Emporer Hadrian's villa in Tivoli. This floor is now in the Vatican Museum in Rome. The mouse in the bottom center of this image gets all of the attention, but what amazes me is the perspective and chiaroscuro on the borders. Incredible stuff. Roman hospitality and banquet throwing skills fell into a body of knowledge the Romans called Ars Convivialis, the Art of Hospitality. There is a restaurant in Rome called Ars Convivialis that recreates the atmosphere and the menu of a Roman banquet. I've never eaten there but I'd love to hear from someone who has. Anyone? Anyone? Anyhow, what prompted all of this meandering was something my friends at Mosaic Art Now posted on their site this week. My love of Roman art and life is shared by everybody over there and another friend of Mosaic Art now is an artist named Maureen O'Keene. O'Keene is a contemporary mosaicist, a master. Like all great mosaicists, she has a great love for the history of her art form. In 2003, Maureen O'Keene and co-director Jane Hubbard based this short, stop-motion animated film on The Unswept Floor from Hadrian's villa. Unswept floor from maureen o'kane on Vimeo. Talk about putting art in historical context. Bravi! If you'd like to experiment with some Roman cookery, resources abound. Here's a directory of ingredients and recipes, Antique Roman Dishes. Hint, Liquamen is Garum, the Roman fish sauce condiment that was as common then as ketchup is today. In fact, modern ketchup evolved from garum. You can still buy Garum Colatura from Zingerman's in Ann Arbor, MI. If you like anchovies, you will love garum. If you don't like anchovies, learn to like them. You'll thank me. Di vos incolumes custodiant! I love the cheater way to decorate your floor so that always look like a good host. I'm surprised that you didn't mention the show Heston's Feasts on this post (unless of course you don't get that where you are); he did a fabulous show on designing a Roman feast and tried to recreate garum from scratch. Heston's Feasts? Home made garum? What is this about which you speak? It sounds like it's right up my alley. What network? Available on line? Tell me things. Sounds like liquamen/garum is very similar to the fish sauce used in SE Asian food. I bet the Romans would have liked trasi/shrimp paste too! They are very similar sauces, I have a bottle of both in my fridge. I love Vietnamese fish sauce on Jasmine rice. Yum. Garum's fishier and not at all sweet and it's terrific on pasta with olive oil and garlic. Double yum! You're in Sydney, right Chookie? You must get some amazing Asian specialties. He did four feasts in season 1; Victorian Alice in Wonderland tea party, Tudor feast, Medieval, and a Roman feast as well. Very neat show, you'd probably enjoy it. Thanks for the heads up, it sounds like it's something I's enjoy thoroughly.